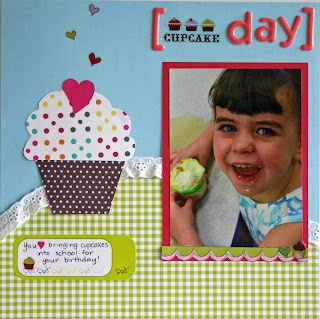 The AC challenge this week is to use AC Journaling and Accent stickers on a layout. I just bought myself some of the journaling stickers for my birthday (hahaha) so I put this layout together. The journaling sticker is from the Backyard Remarks collection. The cupcakes and heart stickers are from the Craft Fair Accents Remarks. The solid and patterned papers are all various American Crafts as well as the large cut out heart, small cut our heart and scallops. The puffy stickers are also AC. The only non AC item is the trim, which I believe is Making Memories. The picture quality could be better but we have not had an ounce of sun all day. I am not complaining because we could desperately use the rain, but it doesn't make it easy to get a good image!! She has got such beautiful eyes! Love the lace and cupcake.